Students consider the ways animals have adapted to survive in different habitats, for example, fish have gills to breathe in water. Animals come in a huge variety of colours, shapes and sizes! These differences are for very special reasons. Animals have evolved to ADAPT to their habitat. Think of an animal - any animal! 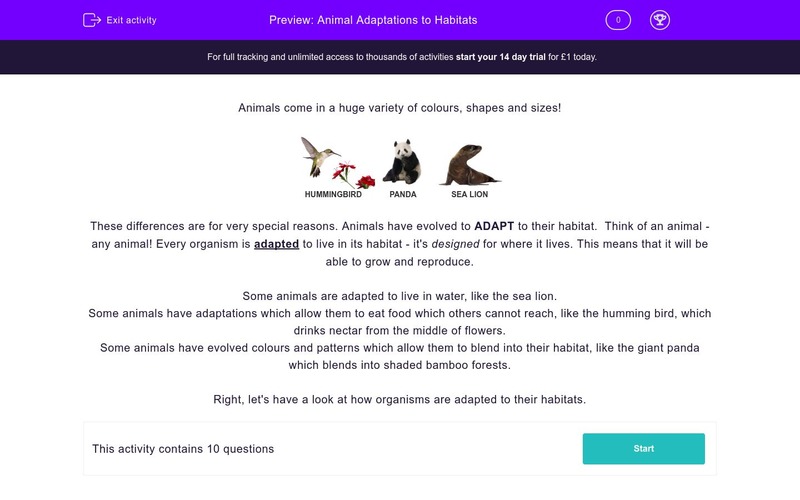 Every organism is adapted to live in its habitat. This means that it will be able to grow and reproduce. Some animals are adapted to live in water, like the lionseal. 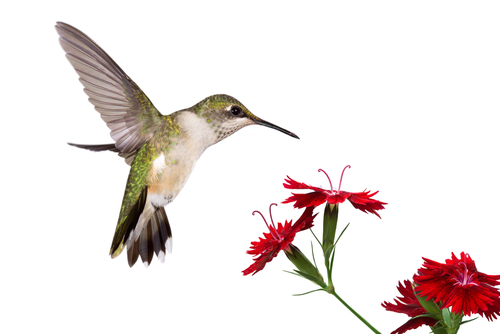 Some animals have adaptations which allow them to eat food which others can not reach, like the humming bird, which drinks nectar. 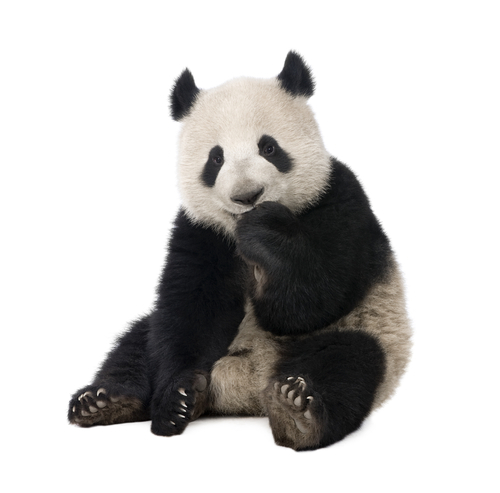 Some animals have evolved colours and patterns which allow them to blend in to their habitat, like the giant panda which blends into shaded bamboo forests. Some animals are adapted to watery habitats in other ways. 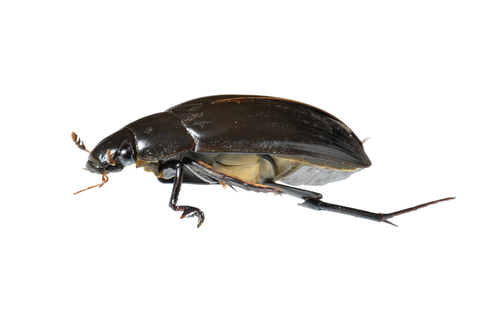 This diving beetle and waterboatmen have which adaptation? 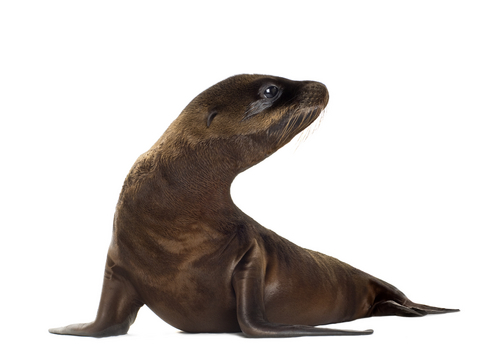 Sealions have adapted to living in the sea where they catch their food. They too have webbed flippers. Which two of these adaptations do they also have? Polar bears live on the ice and snow in the Arctic. Their favourite food is seal. Match up the adaptation with its function. If you live in the water, you need to be able to breathe! Animals have adapted different ways of doing this. 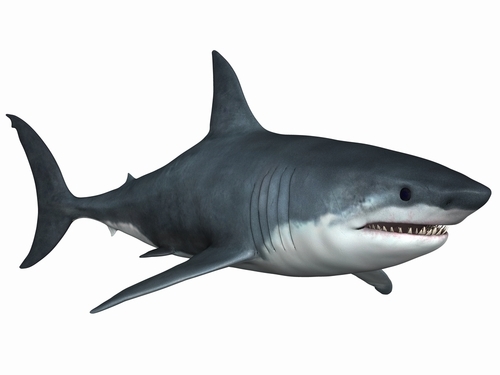 Which part of the shark allows it to breathe in the water? Badgers live in woodland habitats. They dig setts deep under ground and one of their favourite snacks is earthworms. What do badgers have which makes them excellent diggers? Some animals have adapted to being active at night time when it is dark. What word do scientists use to describe these animals? Which three of these adaptations do we find in a range of nocturnal animals? Which of these nocturnal animals uses echo-location? Many swimming animals including amphibians, birds and mammals have webbed feet - their toes are joined together by skin which pushes a lot of water with each stroke. Yes, insects have muscles too! 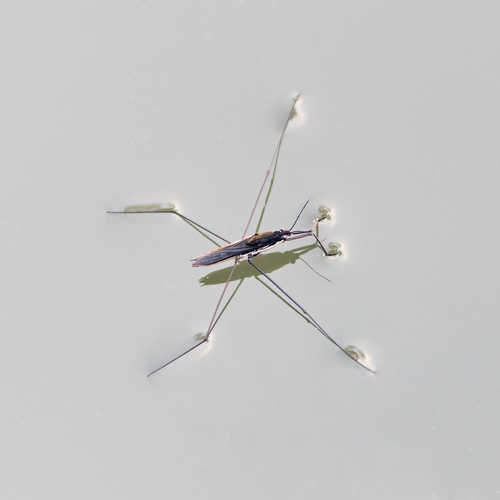 These pond insects push against the water with their big, strong legs. Seals are mammals just like us. They are warm blooded but live in a cold environment. Seals have adapted to the cold by having a fat layer under the skin to keep them warm, but it also gives their body the smooth streamlining needed for super swimming and diving skills. 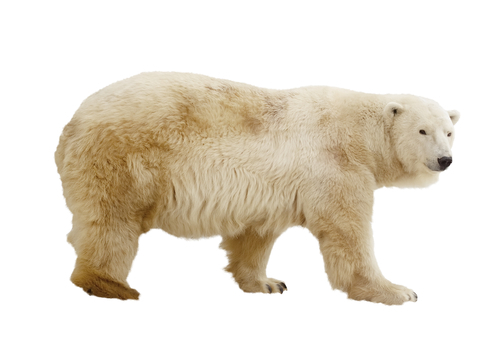 Did you know that polar bears have white fur, but black skin? Black skin helps them keep warm, and white fur allows them to hunt without being seen. Fish gills absorb oxygen from the water in exchange for carbon dioxide produced by its working muscles. Scientist can tell a lot about an animal's diet from its teeth. Sharp pointed teeth are used for grabbing prey and tearing flesh! Ugh! Nocturnal animals need to collect information using very well developed senses. These might be sight, sound, feel, taste or echo-location. Bats make a high-pitched squeak. The sound bounces back off solid objects. The bats' sensitive ears hear this 'echo' and can locate their food and fly safely in the dark. That's clever!